The annual sale for Drakes Traders is set to take place from 8.30am – 5.00pm on Friday, September 30 and from 9.00am – 2.30pm on Saturday, October 1. The popular sale covers everything on the shop floor during the two-day event with shoppers benefiting from generous discounts as deep as up to 50% on select items. Big ticket items include major household appliances by Bosch, Whirlpool, KitchenAid and other renowned brands as well as windows and doors by PGT, Jeldwen, Frameport and tiles by Florida Tile, Daltile, Versace and more. 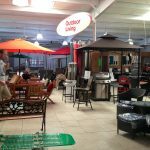 With Drakes Traders carrying the spectrum of household and home improvement goods offered by ACE Hardware and other reliable quality brands such as Stihl, Weber Grills, and CraftsMan, there are savings to be made with every purchase. Drakes Traders is located at Fish Bay, Tortola. New to the island? Find out how to get here.